Why Choose Georgia for Online Higher Education? College education is increasingly important to Georgia’s growing economy. A comprehensive study by the Georgia Budget and Policy Institute (GBPI) backs up this claim. According to the GBPI, 65% of Georgia jobs will require at least a postsecondary diploma or certificate, some college education, or an associate degree by 2020. In this guide, you will learn why attending a Georgia postsecondary school will benefit you when entering the state’s job market. You will also familiarize yourself with essential facts about the state’s higher education landscape, including where to find the most affordable online colleges in Georgia and how to navigate the many available options. Georgia possesses a strong depth in both the number and range of online program options available in the state. It also features a large and growing distance education student population. These factors reflect favorably on the value and quality of online degrees in Georgia and bode well for a variety of demographic groups, including single parents, full-time employees, underserved populations, and employed individuals seeking high-growth alternatives to shrinking legacy industries and labor markets. Online programs in Georgia offer an affordable alternative to traditional education. Non-local students enjoy particular advantages, as many of Georgia’s major higher education systems charge out-of-state students in-state tuition rates for online classes. Georgia’s online schools with tuition policies that charge in-state and out-of-state students different rates typically determine residency by considering an applicant’s income tax returns, vehicle or voter registration, driver’s licenses and other ID documents, and employment records. In most cases, you must establish a permanent home in Georgia well before applying for school, though exact timelines vary from institution to institution. You may also earn in-state tuition eligibility through a reciprocity agreement if you live in a state that borders Georgia and meet certain criteria. Note that online schools in Georgia remain relatively affordable by national standards. As of 2017, tuition rates for both in-state and out-of-state students enrolled in four-year colleges in Georgia were lower than the national averages for all states. Most Georgia schools charge online students tuition rates that match or beat those of attending traditional on-campus classes. Remember, too, that studying online also saves time and transportation costs while eliminating the need for you to relocate to a physical campus. IPEDS data from 2016 counts almost 7,000 exclusively online out-of-state students enrolled at Georgia higher education institutions. Non-residents should take several factors into careful consideration when looking at online universities in Georgia, especially if you live in a bordering state. Some online colleges in Georgia participate in reciprocity agreements and offer “good neighbor” discounts to qualified residents of nearby states. These programs may entitle you to in-state tuition rates, even though you reside elsewhere. However, keep in mind that state agreements and school policies may result in limitations or restrictions on out-of-state admissions to online programs. Research each school’s stance on this matter early in the evaluation process to avoid wasting time learning about programs you cannot attend for eligibility reasons. Georgia participates in the regional interstate compact of the Southern Regional Education Board (SREB). SREB includes 15 states: Alabama, Arkansas, Delaware, Florida, Georgia, Kentucky, Louisiana, Maryland, Mississippi, Oklahoma, South Carolina, Tennessee, Texas, Virginia, and West Virginia. The Academic Common Market (ACM) serves as SREB’s discounted tuition program. Through the ACM, students from any SREB state can qualify for in-state tuition rates if they enroll in an eligible program. Individual institutions determine program eligibility, though in many cases, school administrators elect to include degree programs with little or no availability in other member states. Using the University of Georgia as an example, you could save over $18,500 per year in tuition and mandatory fees through the ACM program. Georgia, like many states, participates in an interstate authorization process that applies to out-of-state students enrolled in online programs. Regulators established the National Council for State Authorization Reciprocity Agreements (NC-SARA) process to introduce consumer protections to online learning by guaranteeing exemplary quality and integrity of academic programs. Institutions participate in NC-SARA voluntarily. While non-participation does not necessarily reflect poorly on the quality or trustworthiness of a given school or program, some education experts would argue that you should favor participating institutions when considering your options. 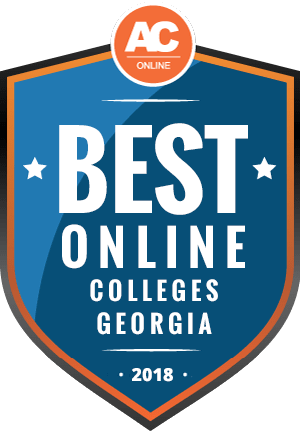 In compiling this list of the best online colleges in Georgia, our analysts employed a comprehensive methodology emphasizing affordability, quality, and reputation. All of the schools on this list hold full accreditation, and we considered both qualitative and quantitative factors in ranking these institutions. Keep in mind that some schools offer only a limited selection of online programs, while others have many more options. As you browse each school’s description, pay particular attention to details that indicate the availability of programs aligned with your academic interests. The growth of online college programs in Georgia demonstrates the state’s overall commitment to higher education excellence. The USG’s 402 online programs, combined with hundreds of programs across the remaining institutions, give students a wide range of options. But which colleges stand out? Which colleges offer the most affordable online programs year in and year out? Brenau University, located in Gainesville,Georgia,is a liberal arts-focused school that offers a variety of online degree programs. The online program at Brenau began in 1998,so the school has over two decades of experience educating students in an online and distance setting,making it one of the oldest online colleges in Georgia. While there are some undergraduate programs offered online,Brenau has a large selection of online graduate degree programs,including master's degree programs in fine arts,education and business administration. Students who prefer to study on campus would likely enter the women's college,the college of fine arts and humanities or the school's quickly growing nursing program. However,there are plenty of other programs offered for students who are interested in areas of study beyond liberal arts and nursing. The Christian history of Toccoa Falls College plays a large role in how students are educated. The school draws heavily upon the ideals of the Christian community,helping students improve their education and character. The online programs at Toccoa Falls are designed with the same ideas and practices in mind but offer the flexibility of a non-traditional education. These degrees are perfect for students who are working and want to gain new skills to further their career. Each course can be taken at the student's leisure,and local students who are working full-time receive additional benefits in terms of financial aid. 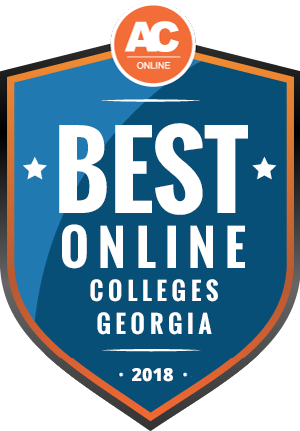 Because of the quality of their bachelor's and associate degrees,Toccoa Falls is considered one of the best online schools in Georgia. Shorter University was founded with Christian values in mind,using these values to craft a liberal arts education that emphasizes educating the whole person. While studying at Shorter,students will be able to strengthen their Christian faith while also pursuing a four-year degree. For those that don't want to travel to a campus,Shorter University offers plenty of online courses and degree programs that can be completed entirely online. These degrees are designed for people who are busy,making it easier to earn a degree while working or raising a family. Shorter University is one of the only online schools in Georgia that offers associate,undergraduate and graduate degrees in the same field,so students who want to earn a degree or further their education can get complete all their schooling at the same institution. The education at Thomas University takes the global scale of the modern world into account. It has always been a popular destination for international students,largely because of the programs offered. Some of these programs are also offered through their online school, a smaller division of Thomas University that gives students more flexibility with their studies. While they've already gained a reputation for being one of the top online schools in Georgia,Thomas University has continued to expand beyond the traditional school setting by growing into an international institution. Students who are interested in studying online or studying abroad might want to learn more about Thomas University and how it can help them succeed. Truett-McConnel College has grown in accordance with its core values which include a focus on personal transformation,family and Christian values. These core values can be found in each of their degree programs as students will be challenged not only to learn but to also improve themselves as individuals. One of the top online schools in Georgia,the online undergraduate degrees offered match the quality of those that students would earn if they studied on campus. They also offer an online graduate program in theology,meant for students who want to learn more about the religious values that built Truett-McConnel. Luther Rice College & Seminary separates itself from other institutions because it's one of the only online schools in Georgia that offers the same degrees as on-campus traditional studies. With over a decade of experience providing online programs, Luther Rice has proven time and again that their online degrees match the quality of their on-campus degrees. The best part is that any degree offered by Luther Rice is accredited and available entirely online. Luther Rice is also recognized as one of the more affordable college options. One of the core values at Point University is leadership,fostered through their on-campus and distance learning degrees. An additional emphasis is placed on Christian values. Point also has one of the most educationally diverse online programs in Georgia with over 30 associate,bachelor's and master's degree programs offered. Some of the popular online degree options at Point are accounting,criminal justice,psychology and human relations. There are also hybrid programs available to students who prefer to study both online an on-campus. Georgia Southwestern State University contains a student body mostly made up of Georgia natives,although many of them opt to earn their degree through the distance learning program. Georgia Southwestern offers numerous online degrees,and they are considered one of the top online schools in Georgia for nursing. Students who do choose to study through the distance learning program can either study toward a specific degree or take individual online classes. This is meant to give students the flexibility to study at their own pace on their own schedule. Because it is a four-year institution,most of the degrees offered are bachelor's degrees. However,there are graduate degree options,as well as post-graduate professional training. The oldest institution of higher learning in the state,the University of Georgia has been teaching generations of students how to succeed in life while by fostering education of the whole person. Students can study toward a bachelor's,master's,doctoral or associate degree at the University of Georgia,and if they prefer,they can take single classes. One of the best ways to earn a degree at UGA is through their online program. Not only do these programs offer more flexibility to students,but they can also come in single course form,letting students bolster their education however they need or see fit. The University of Georgia is home to one of the largest online schools in Georgia with more degree programs being offered than many other schools in the state. Columbus State University has structured their degree programs to fit students during all stages of their education. There are nearly as many graduate degree programs as there are undergraduate degree programs offered,giving students the chance to complete multiple levels of study at one institution. While many students choose to study on campus,there are plenty of off campus opportunities available,such as internships or other real-world experiences. A comprehensive online degree program is also offered. Columbus State offers more online degrees in Georgia than most other local schools,particularly when it comes to graduate programs. There are dozens of graduate programs available either entirely online,on campus or via a hybrid of the two. Georgia Institute of Technology is one of the top schools for research in the state,with many students attending the school to study sciences,engineering and computing. These degree programs are designed to give students the research skills and real-world experience they need to immediately succeed in their profession. However,many students do choose to continue their education to further their career. One popular way to do that is through the online school in Georgia Tech. There are multiple graduate degree programs offered through online school,letting students learn while they continue their career. There are also plenty of online courses available so students can study specific courses at their own pace from anywhere in the world. One of the goals of Albany State University is to offer a high-quality college education while also using a creative,innovative approach. This makes the education at Albany State unique from other state colleges in Georgia. Another thing that sets the school apart is that it's one of the largest online colleges in Georgia's state system. There are dozens of online degree programs offered entirely online at all levels. There are also certificates available to students who want to bolster their four-year or graduate education. Also included in their distance learning are opportunities to live and study in cities other than Thomasville,all while earning a degree and preparing for a future career. A core value at Fort Valley State University is the idea that people from all backgrounds and walks of life can achieve success and accomplish something great. By attempting to be more accessible for all people,FVSU has also tried to be more affordable,and they are considered one of the more affordable institutions in Georgia. The same ideas are applied to their online degree programs. While they currently only offer five degrees,one of which is a graduate degree,their commitment to accessibility makes them one of the more affordable online schools in Georgia. Students who earn an education at FVSU find success not only in their field,but also in empowering the local community. Georgia Southern University is one of the most recognized colleges in Georgia,and their online degree program is no exception. While earning an education at Georgia Southern,students will receive instruction from experts in their respective fields while also gaining real-world experience. Georgia Southern is also home to one of the largest online schools in Georgia for graduate degrees. Dozens of graduate degrees are offered entirely online,many of which are in the field of education. Anyone who is interested in becoming a teacher in the state of Georgia can benefit from a graduate degree,and the flexibility of online learning allows them to study at their own pace. The program is also friendly to active military members who are deployed but still want to further their education. Leadership is engrained in the culture at the University of North Georgia. UNG is a designated State Leadership Institution as well as the Military College of Georgia. For students that are unable to study in person or find it easier on their schedule to study online,UNG also offers a distance education program. Any degree earned online is still accredited and recognized with the same quality as any traditional UNG degree and comes with the same flexibility as any online college in Georgia. Also,students who choose distance learning still receive the same leadership education as students on campus. By combining education with leadership,students studying at UNG end up with a well-rounded education and leadership skills that may help advance career goals. While many state universities and colleges have large classes,Clayton State University offers smaller classes for a more personalized education,all while remaining near the busy city of Atlanta. Thanks to their proximity to a large city,Clayton State gives students easy access to all the benefits that come with city life,including internship opportunities. Students that want a Clayton State education but don't want to commute to school can always earn their degree online, too. The online learning program at Clayton State is as convenient as any online college in Georgia with plenty of degrees and certificates available. No matter which degree you study toward at Georgia College and State University, you'll end up with the same fundamentals: a strong,liberal arts education. This gives students a chance to learn beyond their desired field,and it helps them grow as individuals and leaders throughout their lives. While undergraduate degrees are all completed on campus,there are online graduate degrees offered that can be completed entirely online or through a hybrid setting. This allows students to complete some or all of their graduate studies off campus and at their own pace. Because of their commitment to a strong education,GCSU is considered one of the best online schools in Georgia offering master's degrees. Community and personal improvement are core values at the University of West Georgia. One of the largest public universities in the state,UWG has just about everything there is to offer,including comprehensive academics. Students can work toward one of the 88 degrees offered by the university,and they can do so with traditional on-campus study or online studying. Their online school is also accredited,and allows students to study at their own pace. The core values of UWG combined with the flexibility of their online programs make the school an ideal place to earn an online degree in Georgia. South Georgia-based Valdosta State University offers degree programs for undergraduates and graduates. Because of Valdosta State's close proximity to Florida,they offer in-state tuition to residents of Florida,as well as Tennessee,South Carolina and Alabama. This helps make the school an affordable option for students outside of Georgia,as well as those who live in state. One of the benefits of studying at Valdosta is their comprehensive online school. They offer many different degree programs that can be studied entirely online or through a hybrid of online and on-campus. Valdosta State offers more programs of study than most other online schools in Georgia,giving students the chance to study what they want,when they want. Founded in 1828,Augusta University is one of the oldest schools in Georgia. Formerly Georgia Regents University,Augusta is recognized as a research school,but their health and medicine programs also should not be overlooked. These programs are offered in both undergraduate and graduate degrees,some of which can also be completed online. For example,the college of nursing offers a bachelor's,master's and PhD program,as well as multiple doctoral focuses,that can all be completed entirely online – one of the only online schools in Georgia that offers that convenience. Other programs offered by the school can also be completed entirely online,in person or through a hybrid of the two. For students that prefer to study on-campus,Augusta has three separate campuses,each within the Augusta,Georgia area. The Protestant Christian background of Beulah Heights University has been one of the main driving forces that's led to recognition as a top Bible institute. With Christian values in mind,BHU has used their background to craft a thoughtful curriculum. For example,one large part of their curriculum is teaching students to become leaders in their communities and fields. Another important part of BHU is their distance learning program which gives students the chance to study toward a degree online. Being one of the only online schools in Georgia that offers religious courses online,BHU has established itself as a local leader for undergraduate and graduate degrees in religious areas. These resources will help you navigate your options as you research the top online schools in Georgia. Remember: these are general resources, and you should always perform independent research on the colleges that interest you. Do Online Credits Cost More or Less in Georgia? Each school maintains its own tuition policies, making it impossible to offer a universally applicable answer to this question. However, from a general standpoint, online colleges in Georgia tend to cost the same (or less) as attending traditional classes. This is particularly true of public colleges. As you assess costs, remember that studying online also allows you to avoid some mandatory fees that only apply to on-campus students. You also avoid the need to relocate, which can save significant amounts of money over the course of a four-year degree. Flexible online course structures also make it easy to schedule your schoolwork around part-time or full-time employment, which further alleviates your financial burden and improves the cost-effectiveness of taking part in an online degree. For specifics, refer to the fee tables listed on each school’s official website. Which Georgia Schools Accept the Most Transfer Credits? According to statistics compiled for the 2018-19 academic year, the two Georgia colleges with the highest numbers of transfer students were Kennesaw State University and Georgia State University. While the sizable student bodies of these two schools partially explains the trend, their generous transfer credit policies also attract many new students. At Kennesaw State University, incoming transfer students must possess a cumulative GPA of at least 2.0 on all coursework to obtain advanced standing. Georgia State University’s transfer credit policies permit students to earn recognition for up to 12 credit-hours of D-grade coursework in addition to its already generous allowances. As the state’s flagship higher education system, the University of Georgia also merits mention for transfer students. At the University of Georgia, incoming transfer students require at least 60 credit-hours of qualifying coursework with a cumulative GPA of 2.8 or higher. You can learn more by visiting the FAQ on the University of Georgia’s page for transfer students. Beyond these general guidelines, refer to the specific transfer credit policies of each school under your consideration. Seek out your information on the school’s own website, rather than relying on third-party sources. Will Any Online Colleges in Georgia Accept a GED? According to the General Educational Development (GED) Testing Service, more than 60% of recent high school graduates with a GED go on to enroll in college. The GED Testing Service also states that more than 97% of American employers and higher education institutions recognize the validity of the GED when considering new applicants. Instead of looking at your high school grades, colleges will instead consider the score you earned on your GED test. However, keep in mind that you may be required to take additional entrance examinations, depending on the admissions policies in place at the school of your choice. For instance, if you do not have ACT or SAT scores, you may need to take these tests as part of your application process. If you have any questions, refer them to the admissions department of the school you want to attend. How Many Academic Terms Per Year Do Online Colleges in Georgia Offer? In general, accredited online colleges in Georgia feature semester-based or term-based start dates that occur every few months. Larger schools with sizable on-campus student bodies tend to align their online program start dates with their on-campus program start dates. This supports scheduling logistics and makes it easier for the school to assign regular faculty members to teach online classes, thus ensuring that all students enjoy parity in the quality of their education. Many well-regarded online universities in Georgia employ alternative scheduling models. Some such models apply to most or all of the school’s online programs, while others offer a limited number of programs with flexible start dates and accelerated schedules that allow students to begin their coursework shortly after acceptance. Consult each online school’s scheduling policy as part of your due diligence in the application process. By and large, schools and programs with relatively large numbers of students enrolled in online classes tend to offer flexible start dates or shorter terms that facilitate the ongoing integration of incoming students. A school’s scheduling policy does not reflect its quality, and many highly reputable schools and programs use these alternative models. Which Online Colleges Will Accept FAFSA in Georgia? Millions of American college students begin their searches for educational financing by filing a Free Application for Federal Student Aid (FAFSA). College applicants use the FAFSA to confirm their eligibility for federal, state, institutional, and private forms of financial aid, including federal student loans, Pell Grants, state-based grant programs, school-based scholarships, and private scholarships. As of November 2018, 134 Georgia colleges accept FAFSA. While not all of these colleges offer online programs, many of them do. Use the Federal School Code Search featured on the FAFSA website to search for the Georgia colleges under your consideration. Most FAFSA-supported funding sources make no distinction between online and traditional in-class study, so long as the school you attend holds accreditation from an agency recognized by the U.S. Department of Education (ED). You can confirm any Georgia institution’s status using the ED’s accreditation database. Are There Any Free Online Classes I Can Take from Georgia Colleges? In the early 2010s, a loosely aligned collective of higher education institutions around the world launched a program to make low-cost online education more accessible. The initiative eventually became known as Massive Open Online Courses (MOOC). Hundreds of universities from dozens of different countries take part by offering internet-based students free access to thousands of MOOCs. Georgia Tech’s MOOC offerings allow students to sign up and begin their studies anytime. The school allows MOOC coursework to count toward a verified certificate, should you choose to pursue one. Meanwhile, the University of Georgia system joined the MOOC program in 2013 as part of a partnership undertaken by 10 of America’s leading public universities. However, neither school offers students the opportunity to earn credit for MOOC coursework as part of a degree program. Instead of acting as a means of earning cheap online degrees in Georgia, MOOCs mainly serve as personal enrichment classes, primarily for adult learners. How Can I Find the Online Program Options at Georgia Colleges? Georgia schools that offer both traditional in-class and online learning options typically maintain separate systems and platforms for dedicated use by internet-based students. For example, the University of Georgia system uses UGA Online, a comprehensive web portal to the institution’s extensive catalog of online degree options. Many Georgia-based public and private universities maintain similar systems, with direct access links usually located on the school’s main web page. If you cannot immediately locate a particular school’s system for online degree programs and classes, try using the site-specific search feature on the institution’s home page. Use a general, all-encompassing search term like “online programs” or “online degrees,” then navigate the results for relevant links. Alternately, you can try adding a similar search term as a modifier to the school’s name in your preferred web-based search engine. Students in need of financial aid should consider Pell Grants as their first option, as these federally sponsored subsidies do not require repayment. However, only students in undergraduate programs who have not yet earned a bachelor’s degree qualify for these grants. If these limitations affect your eligibility, or if you plan to pursue an advanced degree, seeking scholarships specific to Georgia-based schools serves as a good backup plan. Open to high school seniors, GED holders, and students currently enrolled in undergraduate studies at an accredited Georgia college, the Constitutional Officers Association of Georgia (COAG) scholarship provides financial aid to students in law enforcement, government, law, business, political science, accounting, and finance programs. To qualify for a Georgia Tuition Equalization Grant, applicants must attend a participating private college in Georgia, have Georgia residency, hold U.S. citizenship or permanent resident status, and pursue an undergraduate degree program on a full-time basis. Awards contribute funds for tuition fees and other eligible expenses. To qualify for this scholarship, applicants must be high school seniors in Georgia and plan to attend a Georgia-based college or university. Eligibility requirements also include extensive high school coursework in English, history, social sciences, algebra, biology, chemistry, and physics, as well as a minimum cumulative average of 85% and an SAT score of at least 1300. Residents of Georgia and Alabama qualify for this scholarship, offered by the ARRL National Association for Amateur Radio. Recipients must hold an active amateur radio license of any class, attend a Georgia-based or Alabama-based college or university, and major in degree programs related to electronics, communications, or radio broadcasting. Georgia residents can apply for this scholarship if they hold U.S. citizenship or legal resident status and currently attend or will attend a Georgia-based public college as an education major. Applicants must also demonstrate financial need and a commitment to a future career in an education-related field.